A new player wants to be able to play as fast as possible! You (A gaming company) advertise on TV, on websites, in magazines and at sport events with the goal of attracting new players. If the potential player finds your ad interesting he goes to your website. If he is still interested after looking at your website for a while then he wants to be able to play your games as fast as possible. But why do so many gaming portals today make this so much more difficult than it has to be? To be able to play you have to register (You shouldn’t have to if you just want to play for fun). Every gaming portal should really focus on making a fast and easy registration process. 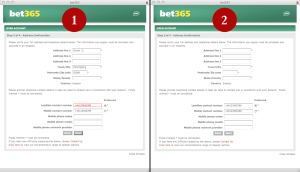 In the image above you see step 2 (of 4) in Bet365‘s registration process. In this step you fill out your adress and phone information. I entered all the necessary information thinking I did it in the right format adding the country code to my phone number. But when trying to go to the next step I got an alert saying the phone number should only consist of numbers. Why didn’t it tell me that information as I was entering it? And even worse all the address information I entered dissapeared. So I had to enter that again along with the phone numbers. I gave up! This is just an example of bad usability that will cause gaming companies to loose customers. Many other gaming portals have lousy registration forms. Designing forms is not something that can be done in 5 minutes. You have to usability test your designs with real players to minimize the errors. It probably would have taken an interaction designer less than a week to design a really good registration flow where the frustrating errors above wouldn’t have happened. So start putting more focus on the player and usability. It will be worth it!